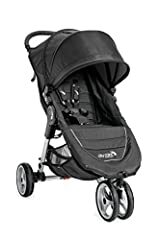 This 17-lb stroller has the simplest fold out there, and it’s a breeze to steer one-handed. Babylist Scout Katy shows you more! When you’re juggling baby, you’ll be so grateful that you can fold, carry, and steer the City Mini one-handed. The smooth maneuvering means you can navigate tight or crowded areas one-handed without hurting your wrist. It’s hard to beat the 17 lb. weight when you’re hoisting it into trunks and up stairs. 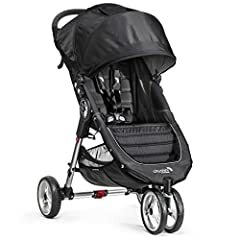 This stroller’s collapsible sunshade gives pretty full-body protection, and comes with a peek-a-boo window. They can sit deeply and comfortably, and the 50 pound limit lasts well beyond toddlerhood. For newborns there’s a full recline option (although getting an adapter to snap your infant car seat into the stroller works better). However this stroller isn’t built for rough terrain. If you plan on steering over a lot of bumps on rough trails, you might want to look at the GT version of the City Mini instead. The GT is heavier, but can handle rougher ground (and nice bonus: the handle can be adjusted to your height). If you need a ton of storage space, neither of the City Minis are ideal. 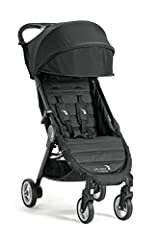 An oversized diaper bag won’t fit under the seat easily, and a heavy bag on the handlebars can overbalance this light and agile stroller. Keep in mind accessories (such as cup holders) are sold separately. 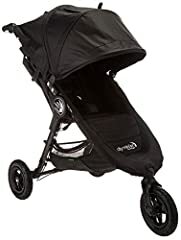 If not used as a travel system, what’s the weight minimum for this stroller?